We are the leading manufacturer and exporter of wide variety of Promotional Coffee Mugs which includes Ceramic Coffee Mugs, Printed Ceramic Coffee Mugs, Designer Coffee Mugs, Logo Coffee Mugs, Printed Coffee Mugs, Oval Coffee Mugs, Corporate Coffee Mugs and Spanish Coffee Mugs. 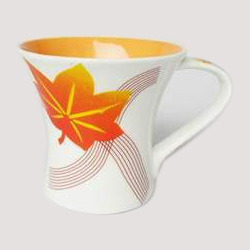 Our experts are designing these superior quality mugs for our clients as per their specifications. Moreover, these mugs are playing a vital role in promotional campaigning activities and are made available in distinctive designs and sizes. 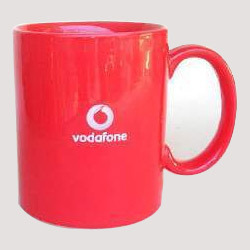 Vodafone mugs or ceramic coffee mugs offered by us are manufactured from superior grade materials such as ceramic and bone china, these designer red ceramic coffee mugs are used across various corporate offices, institutions, colleges etc. for brand promotion and advertisement purposes or as a gift to close ones on special occasions. These ceramic coffee mugs are available in wide range of choices in terms of color, size, design and shape. 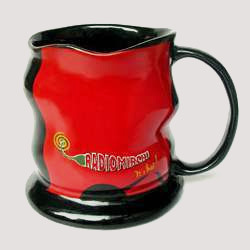 This radio mirchi mug or printed ceramic coffee mugs is manufactured using quality ceramic and thus is highly durable and provide resistance against heat and abrasion. These printed ceramic coffee mugs are available in wide range of vibrant colors and sizes & shapes, these can be designed and developed as per the client's exact needs for advertising and promotional purposes. We offer these mugs at the most competitive prices. We manufacture an array of attractive London coffee house mugs or designer coffee mugs in different vibrant color combinations. 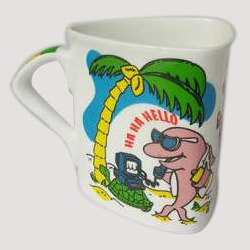 These designer coffee mugs are used as coffee and tea mugs across various offices, institutions, schools, colleges etc. Further they also serve as perfect gift items for any kind of occasions to close ones, employees or clients. These elegant coffee mugs or logo coffee mugs have been especially designed fro our well reckoned client with their brand name printed & logo embossed on the front. The logo coffee mugs are best suited for their brand promotion as well as for gift purposes to employees or clients on special occasions. We also offer these mugs to our various other corporate customers, designed and printed as per their specific requirements. Our array of oval coffee mugs also include these cleopatras oval mug that are printed with funky designs using long lasting printing colors & substrates. Thus, these oval coffee mug ensure durability, excellent shine and also are completely microwave safe. Available in variegated color range as well as sizes and shapes, these are manufactured using top grade raw material. Avail these triangle shaped corporate coffee mugs in most attractive colors with company's logo/ icon printed in front. These corporate coffee mugs can be successfully used for advertisement and promotional aspects as well as can also be gifted to the employees or client's on particular occasions. The mugs are available in various custom defined designs and shapes to all our reputed corporate clients. We offer the broad collection of spanish coffee mugs available in variety of options in terms of color combination, designs, sizes and shapes. Manufactured using world class raw material like ceramic and bone china, these are highly durable and heat resistant. The Spanish coffee mugs can be printed with company's name, logo, other important details or quotes for promotional purposes on client's request. We provide Moolchand mug or company logo mugs that is manufactured from premium quality ceramic/ bone china and has the logo and name of the company printed in the front. The company logo mugs is also available in varied bright captivating colors and different sizes as per client's requirements. These help in meeting the promotional needs of our clients and can also be used as corporate gift.